So here I am. It couldn’t be any other way. Wearing identical stage gear, Aborted arrive in grand fashion to quite an epic intro track and then proceed to spend about 40 minutes or so ripping the place up. Bucking the trend of opening bands having a crap sound, theirs is much better than most, although not perfect; some of the riffs get lost in the mix unfortunately. 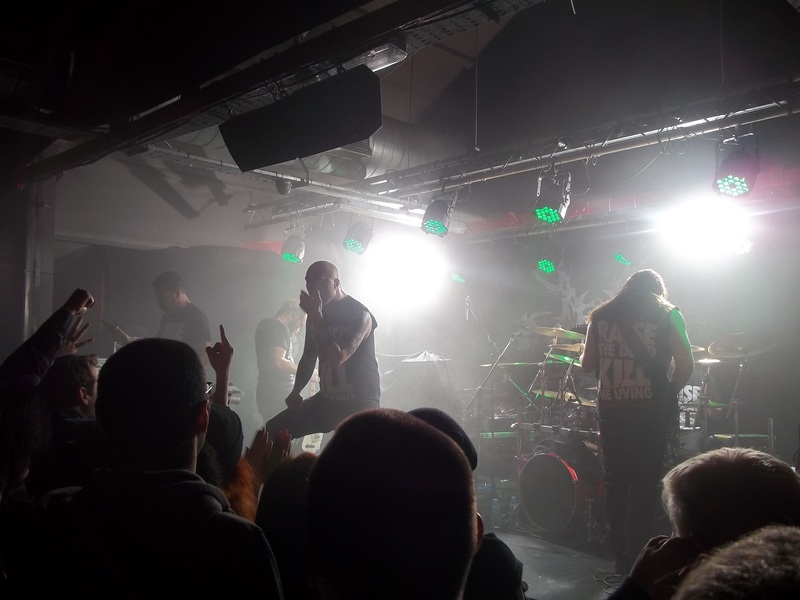 The general gist is there though, and Aborted make the most of their time on stage. The band are full of energy and flailing limbs. Theirs is a no-nonsense performance that prefers to let the music do the talking. Their singer has always had one of my favourite Death Metal voices and tonight he’s pretty much album-perfect. Their music goes down well in a live environment, and the second half/ending of The Holocaust Re-Incarnate is particularly stunning; I don’t think there’s a still head in the venue. They also play a new song off their upcoming album Retrogore, which slots quite nicely into the rest of their repertoire. There’s a very good turnout for this time of night, although it takes a while for the crowd to warm up. There are a few minor circle pits, but Aborted don’t quite get as spirited a reaction as I would expect from a band of their stature. As I say though, it is early, and the crowd definitely get more into it as time goes on. Aborted are on fine form, regardless, and they get me headbanging along. By the end of the set everyone seems quite satiated and Aborted exit the stage victorious. 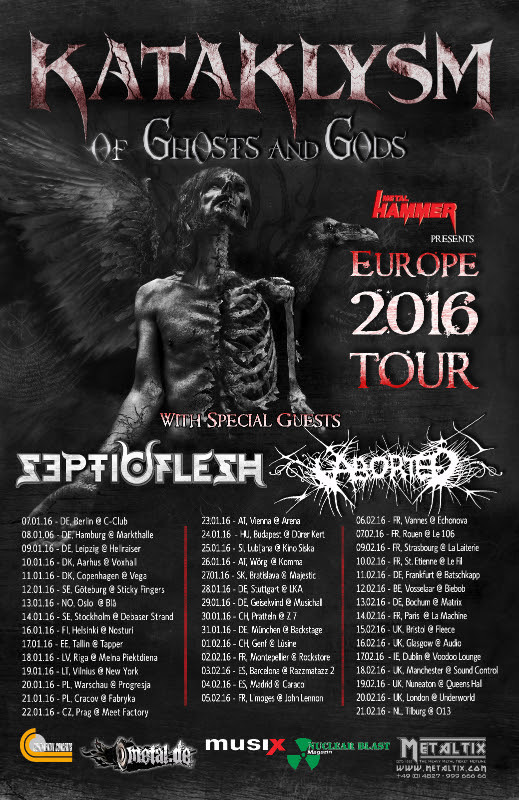 Septic Flesh, (Septicflesh? ), take to the stage to high expectations. Initially lacking a bit of bite in the guitar department, this thankfully doesn’t last long and over the course of the set their sound just gets better and better. The trademark symphonic elements are present and correct, as is their singer’s hearty roar. Both are powerful and most welcome. The crowd looks denser than before and everyone seems to know the songs. The band get a good reaction and the singer reveals himself to be an enthusiastic frontman who has the crowd firmly in the palms of his hands. “Are you ready to destroy?”, he asks. Not quite, but everyone has a great time regardless. Playing songs off their last three albums, the epic tracks come thick and fast, including the blasting majesty of Communion and the grinding grandeur of Order of Dracul. One of my favourite songs off Titan, their most recent album, is also aired – Prototype – and this is simply jaw-dropping, with the choral sections enough to give goosebumps. The Vampire from Nazareth sets a good pace, but it’s Anubis which is the real crowd-pleaser. They end with Prometheus and everyone goes nuts, before the band slip away one by one to its closing refrain, job done. After over two decades of doing this, Kataklysm stalk on stage with the confidence and assurance of veterans. With a wealth of albums to pull tracks from, they launch into a veritable greatest hits-type set, playing songs from all eras, old and new. After some initial technical issues, they soon sound solid and huge, as befits a band of their status. The singer is a classic frontman and knows how to work a crowd. It’s to his credit that he manages to avoid a lot of the cliché frontman talk that tends to accompany the vocalists of most larger bands. 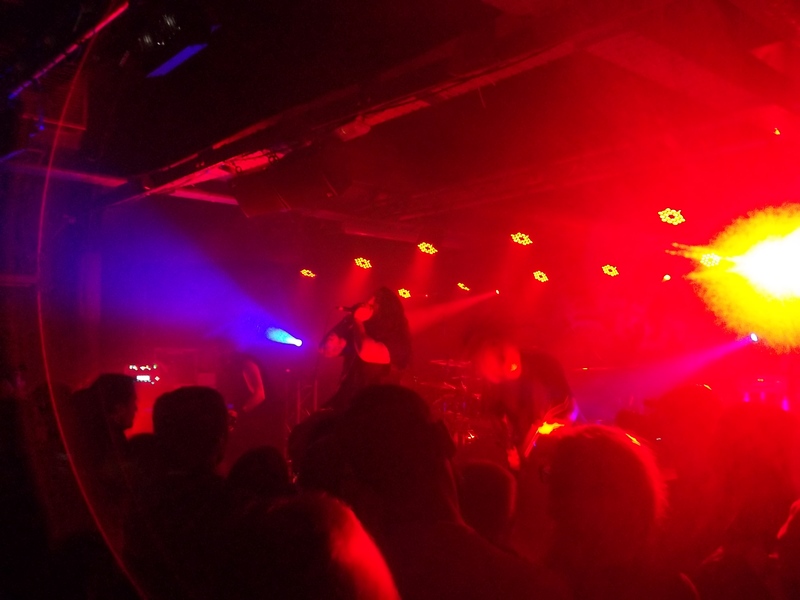 Opening with the first track off their latest album Of Ghosts and Gods, (Breaching the Asylum), Kataklysm start as they mean to go on and give the crowd exactly what they came here for. The band’s song-based combination of blasting, melody and huge groovy riffs is a sure-fire winner in the live department, and sure enough they have the crowd hooked from the get-go. These are songs that are designed to be headbanged too, even when they’re playing at hyperspeed, and headbang we do. During the second song we even get the first stage diver of the evening. (The second is a rather hirsute man wearing nothing but Kataklysm underpants, who proceeds to do an on-stage striptease. It can’t be unseen). By the time we reach the third song of the evening, As I Slither, this is the one that really seems to loosen the crowd up and from then on it’s full speed ahead. As the singer notes before launching into it, this is not a Justin Bieber concert. The Black Sheep is the next song aired off their latest album, and all of the cuts from this release slot seamlessly into their extensive back catalogue. Prior to Manipulator of Souls the singer complains he can’t hear himself on stage, but everything sounds okay to the crowd and the song gets a suitably huge reaction, as does most of their set in general. At this stage in their careers Kataklysm know what they’re doing. Classic after classic, both old and new, pass by, including At the Edge of the World, (a crowd pleaser), Thy Serpent’s Tongue, (a real highlight), Push the Venom, (brutal), The Ambassador of Pain, (utterly stunning), Where the Enemy Sleeps, (massive), Soul Destroyer, (mosh-tastic), Open Scars, (catchy), and In Shadows and Dust, (pit-friendly). They end with Crippled and Broken, which is anything but. One professional, (and sweaty), set later, Kataklysm have proven why they continue to stand the test of time. 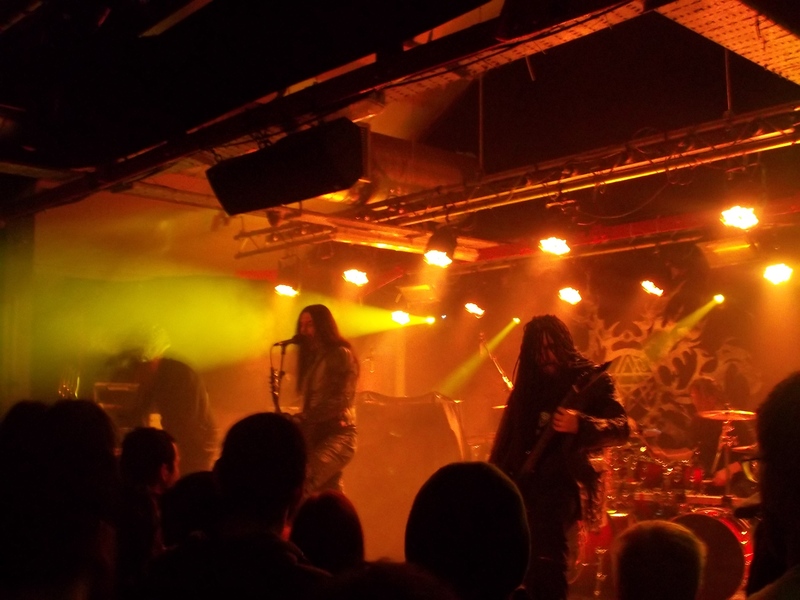 This entry was posted in Live Reviews and tagged Aborted, Death Metal, Kataklysm, Live Reviews, Metal, Septic Flesh. Bookmark the permalink.